A 10 x 11 bull moose shot by Aaron Folk, a mechanic at Basin Electric’s Antelope Valley Station near Beulah, ND, recently ended its stay atop the state record books. A Basin Electric employee’s short stay atop the record books has come to an end. Aaron Folk, a mechanic at Basin Electric’s Antelope Valley Station near Beulah, ND, filled his once-in-a-lifetime bull moose tag by shooting a big bull moose with his bow from about 20 yards Sept. 11 near Mohall, ND. Folk’s 10 x 11 bull had an antler spread of 53 and three-eighths inches and scored 166 and seven-eighth inches, topping the old Pope & Young Canadian moose state record of co-worker Curt Michaelson, instrumentation and control supervisor at Antelope Valley Station, which had stood since 1994. 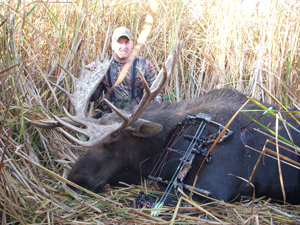 Folk’s state-record bull, however, was bested not long after by Nathan Ingman, Dickinson, ND, who downed a Canadian Moose with a bow near Columbus, ND. Ingman’s moose boasted an antler spread of 57 inches and scored a 181, according to an Oct. 11 article in The Dickinson Press. For Folk, the hunt was never about the record. “It didn’t matter what size moose I shot as long as it was with a bow. Getting one with a rifle would be alright too, but I just wanted to get one with my bow. Getting a fairly good-sized one was a bonus,” Folk says.